30% POST- CONSUMER MATERIAL: Manufactured of USA milled aluminum alloy composed of 30% post recycled material. SUSTAINALBE: Aluminum has an ENDLESS life cycle. As an element; aluminum it can be recycled endlessly -never losing it strength or composition. LONGEVITY: Aluminum carts are repairable, thus making them an investment purchase and not a disposable item. TECNI-QUIP stocks parts and a list of all customer’s past order – Facilitating fast repair of all models built since 1961. RECYCABLE: TQ carts can be fully recycled in your community, for a profit at the end of life cycle. CLEAN AIR: As a Non- Petroleum Based Material, Aluminum omits no toxic chemicals or impurities into the air, thus making it a healthier choice for your staff. NON COMBUSTIABLE: A typical fire burns at 1,0000F not exceeding 18000 F . Aluminum will not ignite but it will melt around 12000 F. Poly and other flammable plastics ignite at 6500 F.
NON-CORRISIVE: Anodizing Aluminum – creates a smooth non-corrosive metal; there are various degrees of anodizing to select from, each can withstand various temperatures and conditions. Made in the U.S.A.: TECNI-QUIP factory is in a centrally located in Texas, making shipping to the any area of the country easy and efficient. Carts ship fully assembled, creating less work for your staff. NEW YEARS RESOLUTION- TO GET ORGANIZED! TQ CARTS AT WORK OR HOME ARE THE ANSWER! Maybe it is all the holiday sweets and our blood sugars run high, that makes us wrap up the holidays fast and not organize for next year? If you are like me – during December I find all types of miscellaneous items that were misplaced last January after the Holiday extravaganzas! Of course, by the time there discovered in a box, I have already purchased additional wrapping paper, napkins, nametags and whatnots….wasting a LOT of Money. 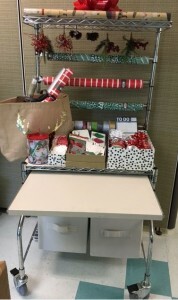 I just shake my head in shame and say NEXT year, I’ll be more organized! However, this idea never makes it on my NEW YEAR’S Resolution List – pity. Artificial trees can last years and years with the proper care. Schneider suggests that you think about the weight of the tree before determining where to store it. “Most artificial trees are too heavy to wrestle into a trap-door attic or lug up a set of stairs. Consider storing the tree on the same floor as it is used, perhaps in an adjacent garage, storage room or closet,” she advises.A rolling case is a great option for easy moving. If you have the space, you can really save time next year by storing your tree without dismantling it. TreeKeeper bags with rolling bases are available in a variety of sizes. A heavy-duty plastic hook allows you to hang the bag from rafters in your garage or storage unit. In a battle between a decorator and a wad of tangled lights, the lights will almost always win. “Use a piece of masking tape and a permanent marker to label each strand. Your note can indicate how long it is or where it was used for easy replacement next year,” advises Schneider. Once that’s taken care of, wrap the stands securely to prevent bulb breakage and tangling. The case shown here provides 2 reels inside of an insulated, zippered bag. Each reel holds up to 100 feet of lights and the removable spools make it safe and easy to maneuver around your tree or entry garland when relighting. Holiday Villages and Collectible Storage Case Schneider suggests that villages should be stored “in one or two cases or tubs by packing the buildings in first, then placing any snow, ground, landscaping or lighting on the top so that you can open the tub and immediately begin building next year.” If you pack your containers with what you’ll need first on top, you can unpack and decorate as you go along instead of having to unload an entire case before getting started. Makes sense since this also puts heavier items toward the bottom and lighter components above. This bag holds up to 20 boxed village components, and features rear wheels and padded handles for safe, easy moving of all your little breakable houses at once. Fragile wreaths of dried berries and twigs could make it another year if they’re stored carefully. Meanwhile, artificial wreaths can stay decorated and fluffy for next year. “If your wreath is particularly large or heavily decorated, consider wrapping it loosely in plastic and hanging it from a nail on an attic rafter or wall peg,” advises Schneider. You can also try one of these crush-proof containers. They may take up more space than their softer storage counterparts may, but they’ll do a better job protecting what’s inside. They can be stacked, or hung on walls by mounting holes on the back. Keep your poinsettia-patterned tablecloths and heirloom tree skirt safe from moisture, mold, moths, and dust by storing them in a hanging vacuum-storage bag. Sure, the airtight space-savers are meant to compress up to 10 garments, but no reason you can’t fold and hang clean seasonal linens, including plush winter throws, too. Next year, you’ll unseal items that are as fresh as they were the day you stored them. This entry was posted in STORAGE CARTS and tagged carts, GIFT PAPER, HOBBY STORAGE, HOLIDAY, HOLIDAY STORAGE, NEW YEARS RESOLUTION, ORGANIZATION, WRAPPING GIFTS, WRAPPING PAPER on December 16, 2015 by admin. If you are involved in Laundry Processing and Linen Transportation you know about this bi-annual event featuring: Laundry Processing Machinery, Linen Suppliers, , Detergents ,Chemicals ,Carts and even Hangers and Safety pins. Basically anything and everything to get linens clean and to the end user. Besides the equipment booths there are Educational seminars to keep us informed on the latest standards, regulations and trends in the Health Care and Commercial Laundry Industry. If you are in the Atlanta Area, take time to visit and walk the show floor. You will be amazed to view the displays of laundry processing machinary that dominate the hall. The automation is amazing. If you are registered to attend, we look forward to seeing you at our display of carts and NEW PRODUCTS for Care Linen Transportation and Distribution. Booth 3925. This entry was posted in Uncategorized and tagged health care laundry, housekeeping, laundry carts, laundry manager, Linen Delivery Carts on March 12, 2015 by admin. Could A Cart Built By TECNI-QUIP Fly??? Good question – well almost. Many years ago our founder “Charles Clement”, an aeronautical engineer, took his knowledge of airplane design and structural engineering and used it to create the TECNI-QUIP cart design, i.e., aluminum constructions, riveted (no welds) and tubular arched design. Yes! A TQ cart, can take the rack and sway that a jet in flight experiences. Calculations went into the design of these carts to transport heavy loads – easily – and absorb the rack and sway during transport – like a jet in flight – without damage to the structure of the cart! Also, it is designed to be a lightweight body or structure – and at the same time support a heavy static load in motion. These factors attribute to the longevity of our products –TECNI-QUIP can boast about – we have hundreds of carts that have been in daily service over 40 years. 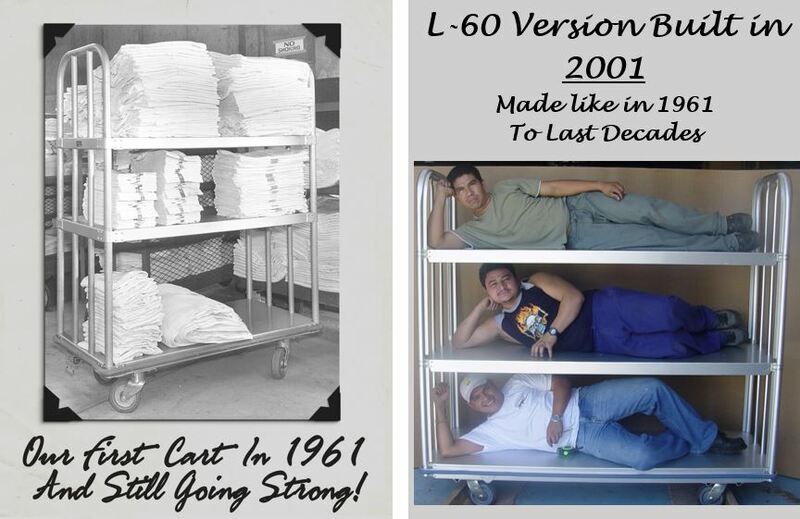 For decades TECNI-QUIP carts have transformed transportation services in many industries: Hotel, Hospital, Industrial Plant, Commercial Laundries and more! With a TECNI-QUIP CART– you are buying a material handling devise designed for transport – not a shelf or box that wheels were place onto the bottom to call it a cart. TECNI-QUIP carts are designed to be employee pleasing, durable and offer years and years of faithful (trouble free) service. If you need parts, they can be rapidly shipped (overnight or via UPS ground) so that your transportation system does not experience any delays! So the next time you need a cart – remember you can have a box with wheels or fly your supplies down the corridor with a TECNI-QUIP cart designed exclusively to transport with minimum effort. Could a Cart By TECNI-QUIP Fly? Husky Series – the name and the fame! Did you ever wonder how the Husky name became affiliated with the TECNI-QUIP Cart Series? Many people are curious and this blog tells how it came to be. A Siberian Husky, is a remarkable athlete, as we all know from the Iditarod Race, but to personally walk or run with them is to appreciate their amazing power, stamina and strength . They are the closest dog breed to the wolf and have the same loyalty and pack mentality of that animal. Protection of their pack is one of their key traits. A Husky, will watch and care over any member of your family – quietly – observing any unknown possible threat. It will warn the Alpha of the pack (hopefully established by the human) of the danger. In 1992 Mike and Jobeth Reilly (owners of TQI) purchased a Siberian Husky Puppy. This awesome creature became the beloved family pet for the next 13 years. Mr. Perot, as he was known, was not an ordinary dog nor did he live a backyard life. He traveled across the country, in the front seat of the Reilly car, as we relocated TQI from Paramount, California to Seguin, Texas. He toured on leash: Taos, Phoenix, Los Angeles, San Diego and Bourbon Street and may other locations during our cross country moves. Once established in Texas in 1996, he frequently came to the TQI office in Seguin, Texas and stretched his 5’ body on the cool tile during the hot Texas Summers. He was well known to our vendors, employees and the local town’s people. To sum it up, Mr. Perot became a part of TQI relocation history. As he aged, the TQI family needed to immortalize him. At this time, were introducing our Wire Mobile Cart & Shelving Series, therefore we named it the Husky Series and placed his great image on the flyers. 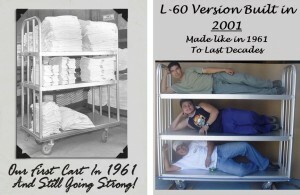 He was then rewarded as the mascot of our entire aluminum cart models for linen transport, the L- Series, SPD and other Linen Carts. We have had many different types of thoroughbreds and rescues dogs since his departure from us, which we love and cherish. However, none can ever amaze or bond with us on the same level as our beloved Husky and friend, Mr. Perot. The Big News from Tecni-Quip Carts is that our NEW and improved website is finally up and running. If any of you have ever created websites, you know it is a labor of love and takes 2x as long than originally believed – to publish it live! Basically, this site is a composite of catalogs describing our standard models i.e. Linen Transport, Central Supply , EVS Collection and etc… + new models that we have developed over the last few years ( along side our customers) for health care and laundries. For our Hotel Side of the Cart Business, you will have to wait a few more months for your exclusive site to be live. This dynamic side of our business has grown over the last few years and demands its own space…. Thank you for your patience… You can contact us for flyers and information directly.